The use of Character-Building Cards is a positive way to reinforce good behavior and the practice of virtue and courtesy in young children. 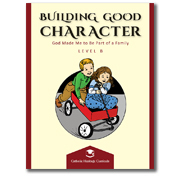 This course for five- to seven-year-olds includes 30 full-color cards covering five topics: Respect, Attitude, Church Manners, Charity at Table, and Virtue, as well as an illustrated chore chart ("Learning Responsibility through Chores"). Although designed for weekly presentation, as much time as desired may be spent on a particular card before moving on to another. Note that cards need not be introduced in order. For example, if a child is struggling with honesty, use the Table of Contents to select the “Honesty” card. Similarly, the “Charity at Table” cards are ideal preparation for a family get-together. Post one card at a time in a prominent place after discussing the week's virtue and how your child can put it into practice.Throughout the month, be generous in "catching the good" and apply stickers to the card when you see your child putting the character goal into action. At the end of each week, reward your child with a small treat or privilege for practicing good behavior. A suggested read-aloud story chosen from Devotional Stories for Little Folks and Devotional Stories for Little Folks, Too can be used to introduce the theme each week. Children love hearing these “Greg stories” read aloud to them! Use the topical index in the back of each book to select additional stories based on character-building themes. 72 pages. 8½"×11" cardstock cards. Loose-leaf, shrink-wrapped. Pages are not reproducible; each child will need his own set. Ages 5–7.